You are here: Home / Adam in the Media / Adam Lambert Stirs It Up With RuPaul On What’s The Tee? You want to hear the best interview with Adam Lambert? 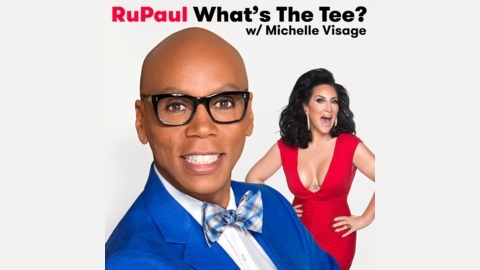 It’s on a podcast with RuPaul called What’s The Tee? w/Michelle Visage. The talk was frank. It was about subjects I’ve never heard Adam go this deep into before, like his feelings about the business, his personal money management, even questions about Sauli and Idol. The friendship between Adam and Ru is very evident and maybe that’s a reason for Adam’s total disclosure. This was taped before this summer’s Queen + Adam Lambert tour but not released until a few days ago. It’s just over an hour, so find something to do at home (like folding laundry) and put on some earbuds to totally devote yourself to it or plug it into your car stereo and escape the monotony of a long drive. But just to give you fair warning, Adam being Adam, I know some of you aren’t going to be comfortable with some of the things he confesses to, but remember it all comes from a good place – his total honesty. You can get it free on Apple Music/iTunes or listen from the following SoundCloud link. He said there’s a DVD of one of the QAL shows coming out really soon! Whoop, whoop!